Beyond Neverwonder is a mixed-up cross between Alice in Wonderland and Peter Pan that follows a girl named Alice who thinks she’s seeing things when a mysterious hole appears out of nowhere just outside her new school in Tokyo, a hole that apparently only she can see. Through a series of events, she ends up down the hole and in a land called Neverwonder, where things don’t always reflect reality and what you see in the mirror may just be the end of all things. The comic is currently being produced with initial sketches done traditionally (pencil scribbles, yo! ), then scanned using the Canon CanoScan LiDE 25 scanner and inked on a Wacom Cintiq 12wx graphics tablet using Smith Micro’s Manga Studio 5. Coloring and lettering is all done in Adobe Photoshop CS6. Tim Georgi was born in March 1976 in Kailua, Hawai’i, on the island of O’ahu. His family lived back and forth between Utah and Hawai’i until 1979, when they permanently relocated to Utah, where he lived growing up. In 1995, at the age of 19, Tim served as a missionary for two years in Quezon City, Philippines. While in the Philippines, he learned the country’s official language, Tagalog (though I’m horrible at it today… not much use for Tagalog in “normal” life back in the States). In recent years, Tim has lived in a variety of places, going from Utah to places like Chicago, Los Angeles and Kansas City.Tim likes to do a variety of things, including writing, drawing, watching anime, using and fixing computers, listening to music… stuff like that. As for his online activities, he’s been involved in a wide variety of things. Tim was the graphic designer and webmaster for Elfquest.com, the official website of Warp Graphics, Inc., the publishers of the Elfquest comics series. He has also done a fair amount of Elfquest-based storywriting/roleplaying with friends starting from the early days of AOL. In addition to his webmastering and designing for Elfquest.com, Tim was also the colorist for the first three volumes of the European release of Elfquest: Dreamtime through German publisher, Carlsen Comics. It was Tim’s first major comics project and he is glad to have been able to be a small part of bringing a part of the Elfquest universe to life. 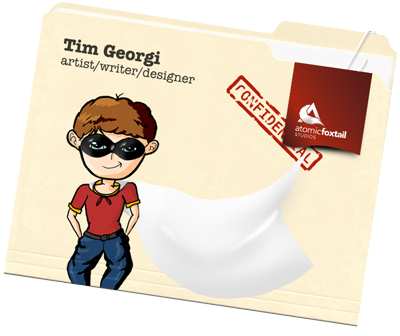 In his alternate life, Tim is the Art Director at American Name Services in Orem, Utah. When playing in the freelance arena, Tim does work as a graphic/layout designer and web producer though his company, Skyfall Communications LLC. To see some of the design work Tim has done, visit his design portfolio at http://www.timgeorgi.com/ . Tim has spent several years working in the Japanese animation convention arena. Tim was a member of the senior management staff of Anime Central in Chicago, IL from 1998 until 2003. Currently, he’s a member of the Board of Directors for Utah Anime Promotions, the sponsoring organization for Anime Banzai in Layton, UT, just north of Salt Lake City. Tim’s current project, Beyond Neverwonder, is an attempt to get back into the art and comics scene after not having drawn much of anything serious in over 10 years.